Blitz is a rare type of British film – the cop film. They just don’t come along too often these days – our cops spend their time policing TV screens in all their variegated variety – to the point where Hot Fuzz was a pastiche of how a US cop film set in a small British town would have turned out rather than transplanting a British one. 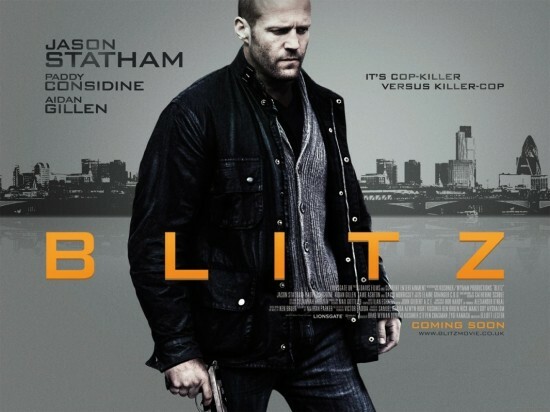 So Blitz was interesting if for no other reason than to see how it would tackle the genre on the big rather than the small screen. To add to the interest was the casting of Jason Statham, Paddy Considine and David Morrissey in the same film. If nothing else it deserves some attention for having the balls to open the same week as the juggernaut that is Pirates of the Caribbean: On Stranger Tides. The Good: Paddy Considine and the other character actors lift Blitz out of being just another Jason Statham man on a mission movie. It’s not that I dislike Statham but I thinks he’s better when he’s got a strong or interesting cast around him (The Bank Job, The Transporter or Lock, Stock and Two Smoking Barrels) than when he has to carry everything himself (especially Crank and to a lesser extent The Expendables). Here, while he is essentially Statham being Statham’s usual character he does interact with other cast members with more than just his fists and a one liner. There is a leaning towards British social realism rather than Hollywood action. Blitz also harks back to classic 1970s British cop shows like The Sweeney and Special Branch or cop shows set in the 1970s Life on Mars. If it weren’t for the mobile phones and the CCTV this could have been the 1970s. The Bad: The central cop killer plot is sadly a bit of a stretch and it gets stretched further and further as the film goes on. That plot is driven by the character of Barry Weiss (Aidan Gillen) from his record he was just a small time street criminal till he was humiliated by Statham’s DS Brant. Only then does he come up with a master plan to take revenge on the police. For awhile he becomes a Moriarty like figure who knew where all the CCTV was and who had a car stashed in a car park for months. Yet then he’s switches to making it up as he goes along which he has a Captain Jack like ability to be and do the right thing at the right time almost without a thought. The film seems confused about creating a sense of psychological realism around the Weiss. For the first two killings he’s cold and calculating. Then for all his bravado he lost his lunch after the third killing, so why not the earlier ones? Yet we learn he has previous for GBH so is this a film about a hardened nutter or a carefully studied piece of psychological realism? I don’t think this was Gillen’s fault it just doesn’t seem to have been thought through when the script was being written. Then there was the minor niggle of why change the name of the Metropolitan Police to the London Police? Was someone worried that foreign viewers wouldn’t work out where they policed from the aerial shot of the city and the repeated mentions of London? The Ugly: This is an ugly film in a good way. A lot of work has gone into making this a film that shows the ugly and ordinary sides of London. There are a few money shots where they slip in a landmark in the background or in an aerial shot but by and large they work hard to place this film in a real, non tourist city. The portrayals of violence in many of the 1970s shows and films caused an outcry in the press yet seem tame now. Blitz doesn’t pull any punches – the violence is uncompromising, visceral and not for the squeamish. I found it uncomfortable to watch at times but it did tell us a lot about Brant and what he was capable of. The Verdict: Blitz is a solid British movie that was an enjoyable diversion for an evening. I don’t think it will become a classic or even a cult movie. I do hope it does well enough to encourage more Brit Cop flicks to be made and more films with Statham with a strong supporting cast or Considine in the lead. I won’t be rushing to get the DVD but if you don’t see it at the cinema worth taking a look at. Do you know where in London the film was shot?